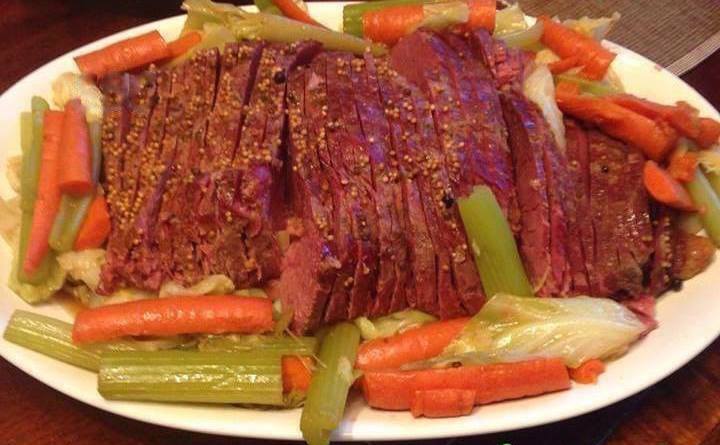 A delicious corned beef recipe made with Guinness beer! Place beers and brown sugar in crockpot and whisk together. Set rinsed corned beef in crockpot. Set onion next to beef. Sprinkle seasoning over the beef. Set crockpot on low and cook for 6-7 hours. Place vegetables in large pot. Pour 2 cups of broth from corned beef over the vegetable. Bring to boil then simmer covered for 20-15 minutes. Cook carrots and celery 10 more minutes. Set cabbage on serving plate, set sliced corned beef over it. Then carrots and celery around the beef.